I liked this movie, but I didn’t love it. I wanted to, but there was just too much to love. I remember the first time I read Tolkien’s classic children’s novel, The Hobbit, and what a fun and quick read it was. When I subsequently read his follow-up work, The Lord of the Rings, I was immediately struck by the differences, almost to the point of wondering if it was the same author. As light and fast-paced as The Hobbit was, The Lord of the Rings was heavy and laborious. It was an amazing story, but you really had to work for it. At some point in reading LOTR, it dawned on me that part of Tolkien’s genius was his ability to write The Hobbit basically from Bilbo Baggins’ perspective, a diary or journal of a simple hobbit who had an extraordinary adventure and wrote it down for his family. The Lord of the Rings, on the other hand, was a much more academic, detailed, omniscient third-person account of the history of Middle-Earth. They weren’t supposed to sound or feel the same; one existed inside the other. When Peter Jackson’s trilogy of The Lord of the Rings was released, I was mesmerized by stunning cinematic presentation, and eagerly anticipated each installment. And although the theatrical runtimes totaled about nine hours, when it was released on DVD in the extended director’s cut, nine had become 12, but that was just fine with me. In fact, if Jackson had decided to release another six or seven hours, I would have been thrilled. After all, there was so much ground to cover in The Lord of the Rings that you couldn’t possibly shove all of it into a mere nine or 12 hours. But The Lord of the Rings is not without its flaws. There are some goofy additions that I could’ve done without, and there are some glaring omissions that I still don’t understand. Much of the heart and soul of Tolkien’s story was the recounting of Aragorn as a healer, and, toward the end of the story, the Scouring of the Shire. But those are complaints for a different day and a different review. What is relevant is understanding that while The Lord of the Rings needed to be broken up into at least three parts and spread out and fleshed out to cover literally volumes of material, The Hobbit did not. By comparison to its sequel, it’s practically a pamphlet. But not in the hands of Jackson. For some reason, Peter Jackson believed he had to top the grandeur and scale of The Lord of the Rings, administering cinematic steroids to our intrepid little story until it was almost grotesquely unrecognizable. Characters and subplots were added all over the place to considerably lengthen the story. And given the amount of money The Lord of the Rings trilogy raked in, well, it’s not hard to understand why more movies is better for your bottom line. But not necessarily for your story. Besides the fact that The Hobbit feels long (and that’s just the first installment), we’ve also completely lost the playful, narrative perspective that made The Hobbit stand apart from The Lord of the Rings. Now it just feels like some deleted scenes from The Lord of the Rings, really. And it’s not the actors’ fault. Ian McKellen is still wonderfully wizard-like as Gandalf the Grey. 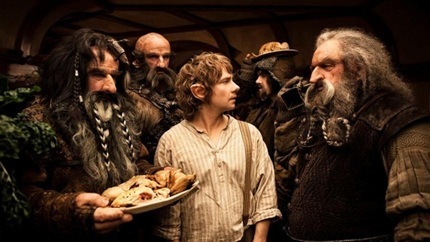 Martin Freeman as the young Bilbo turns in an amusing and likable performance, and a quorum of dwarves is made up largely of actors I’m not familiar with, but who are appropriately dwarfish in appearance and mannerisms consistent with the previous films. The basic plot has Bilbo Baggins unwittingly joining Gandalf and a band of dwarves on a quest to reclaim their lost kingdom of Erebor from a nasty dragon named Smaug. Between Bag End in the Shire and the mountain kingdom, Bilbo and company encounter all sorts of creatures and characters, including Gollum (portrayed again by the amazing Andy Serkis), from whom Bilbo accidentally acquires The Ring (as in, One Ring To Rule Them All), as explained in great detail in The Lord of the Rings. One of the many un-necessities was trying to introduce a bunch of characters from the LOTR trilogy who weren’t originally in The Hobbit. Nor did they need to be. But Peter Jackson apparently lacked faith in Tolkien’s storytelling skills or the audiences’ cognitive capabilities, so he felt like some character foreshadowing was imperative. It wasn’t. We didn’t need to meet people who would show up later in The Lord of the Rings; this isn’t their story, it belongs to Bilbo Baggins. You might be thinking long about now that I hated this movie. I didn’t. I liked about half of it. Which half? Whichever half moved along and didn’t dawdle. Dwelling on superfluous scenes and dumb sub-plots clogged the flow of the movie up to the point where I felt compelled to check my watch, more than once. Yet my admiration for Tolkien’s work and the folk who inhabit his world made me want to watch, hoping it might improve. And I guess it still might, in the six or seven hours that remain in the final two installments. I wish that Jackson had made one movie, three or four hours long, that crammed the whole Hobbit into one big, fat, sloppy cinematic sandwich. Instead, I feel a little like that old Wendy’s commercial with Clara Peller demanding, “Where’s the beef?” Maybe for the next sequel I’ll bring my copy of The Hobbit along to read during the slow parts, and I bet I might even finish reading it before the movie ever gets around to the end.